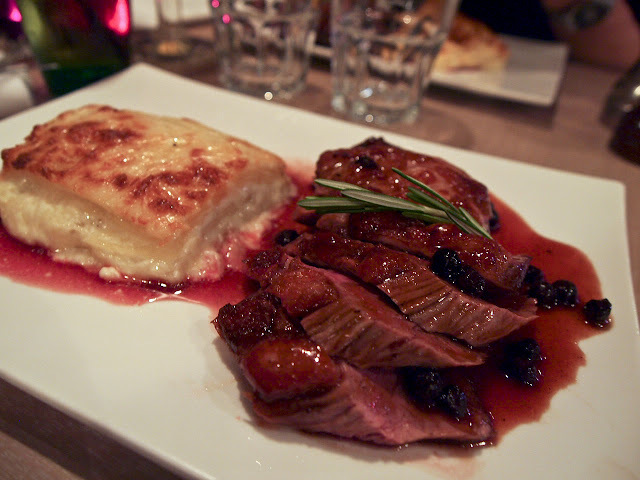 On our third night in Paris, Manbacon and I decided to try out Chez Pommette, a little restaurant we'd seen the day before while exploring Montmartre. The red exterior and handwritten menu on blackboards made the place seem warm and inviting. However, a glance through the window showed only two people (a rather stern-faced middle-aged couple) in the restaurant, even though it was dinner time and other eateries nearby were packed. A bad meal at home is unpleasant but easily brushed off, but a bad meal on holiday, when you have so little time to try out all that a city has to offer, can feel devastating. I wasted stomach space on this? Still, it was getting late, and we were starving, so we entered with a little bit of trepidation...and received a warm welcome from the only waiter in the place, who told us to seat ourselves wherever we wanted. I was craving duck, but a perusal of the menu showed no such meat on offer...until the waiter set the specials board down, and there it was, the magic word - canard. 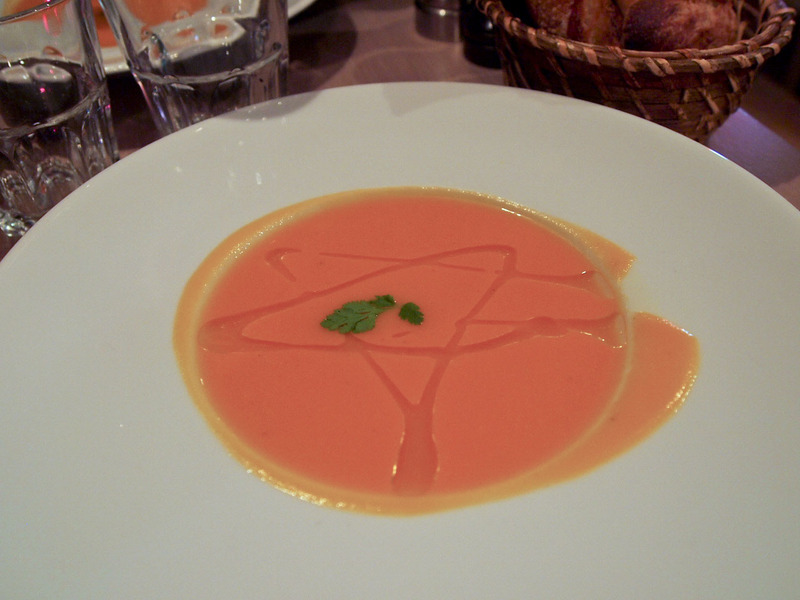 We started with the carrot veloute - thick, rich and velvety, a world apart from lacklustre Tetrapack supermarket soups. It was intensely moreish, and went very nicely with the complimentary basket of crusty baguette slices on the side. I was trying very hard not to lick the bowl when I got to the bottom! Next up, the main event - a glistening magret de canard served with a rectangle of potato dauphinoise. We asked for the duck to be served pink, and it came out beautifully so, with the skin seared til crispy and a little layer of fat beneath it. It came with a sauce made with some little dark berries - not quite sure what they were exactly, juniper or sloe, maybe - the tartness of the berries helped lift the meatiness of the duck breast. Oh, and I'm pretty sure dauphinoise is my favourite way of eating potatoes (yes, even more than chips). This particular example was especially memorable, with the potatoes sliced thinly and evenly coated with creamy goodness. We'd be eating them every other day if I wasn't so lazy. We were both completely stuffed, but there was dessert to be had. 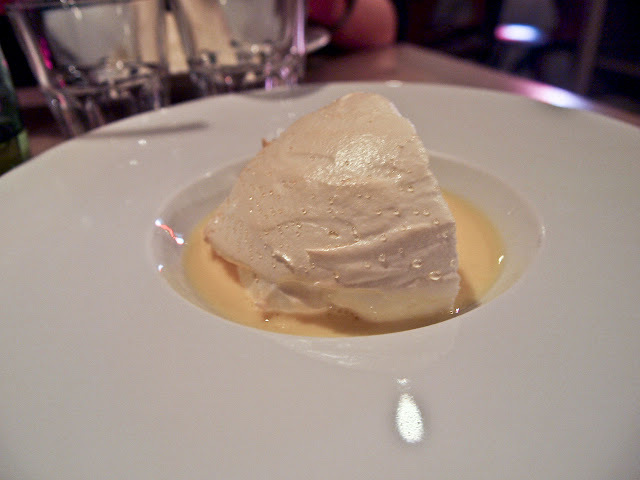 I love ile flottante, and it's easy enough to make, but it's just never really occurred to me to make it at home for a fancy dessert. Anyway, this version was slightly marred by the ratio of meringue to custard. Too big a blob of meringue (also a bit too toothachingly sweet), sitting in a sad, shadow little pool of custard. More iceberg in a puddle than the delicate floating islands they are meant to be. Please sir...I want some more (custard). Still, that wasn't enough to destroy what was overall a very enjoyable meal. One more thing - our little tip seemed to please the waiter inordinately. He smiled and waved to us so enthusiastically as we were walking out that I thought his hand might start a hurricane all on it's own. For a moment there, I thought I might have accidentally left him a €50 note. Maybe he's just always this happy when customers leave the restaurant? Will you let me know if you happen to eat there too?